Japanese Takeaway - Fusion Cuisine Chinese Restaurant - Sushi Restaurant - Japanese Restaurant - Sushi Delivery : Lovely Food Complimented by a lovely View . Takeaway Lanzarote - Restaurants Puerto del Carmen Miso Shiru - Miso Soup Kazan Salad - Seeweed Salad Sushi Sashimi Moriwase - Mixed sushi and sashimi Tempura Moriwase - Butterd prawns and mixed vegetables Liuka - Lobster Yakimeshi - Fried rice Yaki Yasai - Assorted Vegetable Tenshioku - Desert. Takeaway Lanzarote - Restaurants Puerto del Carmen Starter Spring Roll Deep fried Wantun Gyoza Maki Sushi California Maki Miso Soup Hot and Sour Soup Vegetable Tempura Japanese Bread Japanese Salad Suimai Main Course Chicken,beef or pork choose one sauce Skewerd Chicken Fish Pork Ribs Spare Ribs The dishes are accompanied with rice or nuddles. 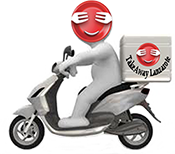 Takeaway Lanzarote - Restaurants Puerto del Carmen Best Japanese Delivery Restaurants Puerto del Carmen Lanzarote - Japanese Food Delivery Service across Canarias from Best Restaurants with Delivery Takeaways.